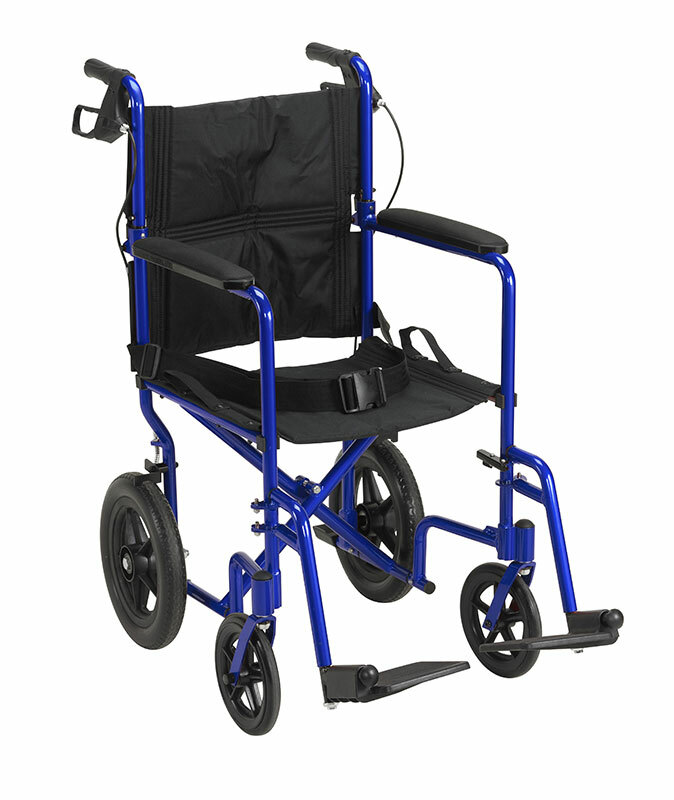 Drive Medical Lightweight Transport Wheelchair w/Hand Brakes Blue which is manufactured by Drive Medical. Drive is a leading manufacturer of Home Medical Equipment products. At ADW Diabetes, we offer a complete product line by Drive Medical. Although the Expedition 19" Aluminum Transport Chair in an attractive blue by Drive Medical weighs only 19 pounds, it supports up to 300 lbs. This transport chair comes standard with 12" rear flat free tires to provide a stable ride over a variety of terrain. The companion activated wheel locks and seatbelt make the Expedition Aluminum Transport Chair safe and easy to use. The Expedition folds down flat for convenient storage and transportation. Folded Dimensions: 38" x 10.75" x 38"
Rear Wheels: 12" x 1"